I’ve gone through a pretty significant amount of upland hunting vests over the years. Some of them were great & got worn out, others ended up getting pitched out of frustration. We hunt in northern Wisconsin, so we definitely get all that each season can throw at us. From 70+ degree days in September to below zero days in November & December, we need all the versatility we can get out of an upland hunting vest. Between your upland hunting vests & your brush pants, the right gear can make even a slow hunt enjoyable & relaxing. Get into some bad gear though, and the best hunt ever is still going to be a major pain. With that in mind, we’re going to run through our list of our favorite hunting upland hunting vests. This is an entirely unbiased list, and we haven’t been paid by any of these companies to review their gear. We’re simply trying to help you make your decision on your next purchase. Versatility – Can you use the vest both in the early season & late season? Security – Nothing is worse than realizing you lost half a box of shells in the grouse woods. Availability – The vests should be a heck of a lot easier to find than the birds you’re hunting for. Sizing – We’re looking for a range of sizes that fit all hunters, not simply the standard medium – X-Large. Value – The vests don’t have to be dirt cheap, but if they’re expensive they better be worth it. Notes: Much like the Cabelas Men’s Cool Mesh Upland Vest, the Cabelas Upland Traditions vest is one of the best bird hunting vests around. 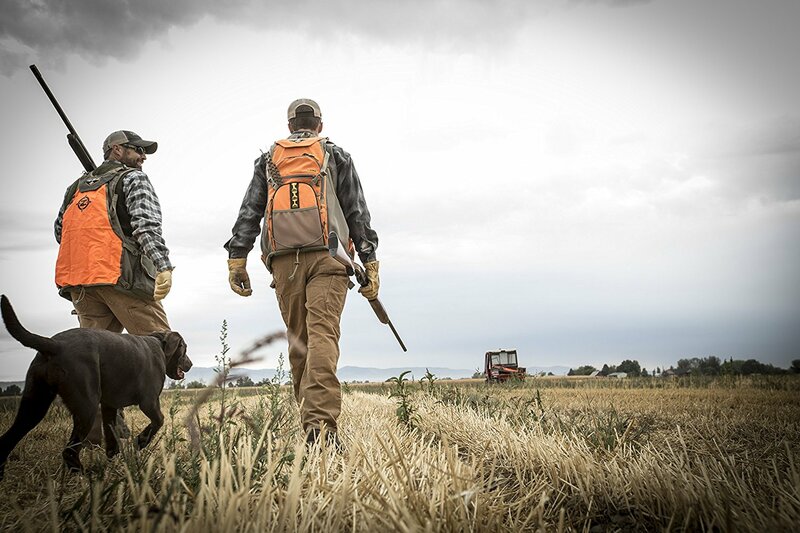 Made from 100% cotton canvas, this bird hunting vest is made to last and won’t let you down in the field. 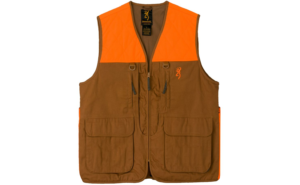 Whether you’re hunting pheasant, grouse, or quail, this vest can pretty much do it all. It’s light enough weight that it won’t have you sweating bullets in the early season. However it’s also heavy enough that it works late into the fall with just your normal upland hunting shirt. The pockets are plenty big enough to carry more than enough shells with you. Plus there is room for a pair of gloves, your hunting GPS, first aid kit, and your dog’s E-collar remote. Just like the cool mesh vest, this bird hunting vest has a blood-proof lining in the game pouch to keep your back clean after bagging a few birds. The quilted shoulder patches are a nice touch, and you won’t notice any difference between this and your upland hunting shirt. While you can’t see it in the photos, this bird hunting vest also features an interior pocket for storing your wallet or phone. This is probably the best bird hunting vest on our entire list, and if you are stuck between multiple options this is probably your best bet. Notes: If you’ve been around the upland hunting game for any amount of time, you more than familiar with the Browning brand. Heck, there’s a very good chance the shotgun you’re carrying out into the grouse woods is actually a Browning shotgun. My personal favorite carry in the grouse woods is a 20 Gauge over/under Browning Citori Cynergy with a 26″ barrel. Well, this Browning men’s Pheasant’s Forever upland vest is certainly right up there with any of the best upland hunting vests on our list. There’s plenty of room for shells in the front pockets, and as expected there is a bloodproof game pouch in the back. One thing we noticed about this particular upland hunting vest is that the birds were quite a bit easier to get into the game pouch than other vests. Another great feature is the attached D-rings on the front (just underneath the blaze orange portion). These are great for attaching your dog training supplies like a whistle or connecting the lanyard of the remote collar so you don’t risk losing it. 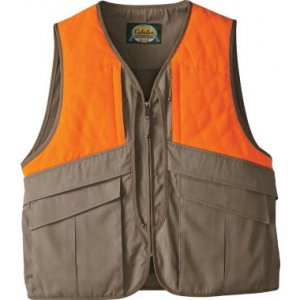 We’re going to rate this particular vest right up there with the Cabela’s Men’s Upland Traditions vest. 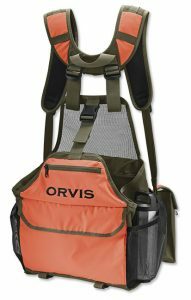 Notes: The Orvis Pro Series VestÂ is in our opinion the best upland strap vest on the market. After wearing it on a few hunts, it’s abundantly clear that Orvis knows what they are doing when it comes to designing gear for upland hunters. There is obviously a reason that Orvis has been serving upland hunters since 1856, and that says a lot about their quality. 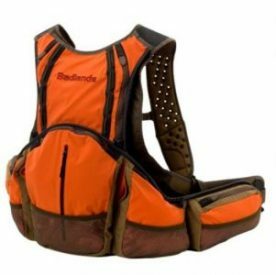 A major perk of the upland strap vest is that they are able to adjust to fit you almost perfectly. Whether you’re a short, tall, slim, or wide, this vest is going to be able to adjust to what you want to do. If it sounds like I’m gushing nonstop about this vest, that’s exactly what I’m doing. The Orvis Pro Series Vest is very clearly the best upland strap vest on the market in 2018, and I honestly don’t even know if its close. Of all the vests on this list, I would pick this Orvis upland strap vest every single time. Our final consensus is that this upland strap vest by Orvis is the best upland hunting vest on the market. You can buy this with absolute confidence that it’s going to be worth every penny. Unfortunately women don’t get as many options to choose from when they want to buy a pheasant hunting vest. The good news is that while options may be limited, the quality is in great supply! 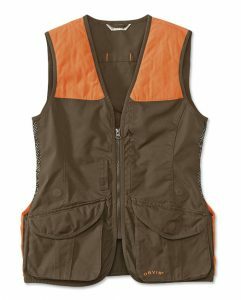 This Orvis women’s upland vest is by far the best womens hunting vest we could find. Designed by women, for women, this super functional upland hunting vest offers great fit and performance in a durable fabric, making it an essential for all the serious bird huntresses out there. They’ve incorporated some of the same features from our favorite upland hunting jacket into this womens hunting vest. Orvis included the magnetic pocket design that we love so much, allowing you to keep your pocket open or closed at any time. The Gamehide Switchgrass is offered in a full menu of sizes, and two different colors. Notes: If you’re on a budget, Gamehide did pretty darned good with their Switchgrass upland hunting vest. They offer a sizes from Small all the way through 4XL, and while we wouldn’t consider the vests “fitted” they don’t get in the way too much. I don’t think I’d want to wear this vest on an 80 degree day, but it is relatively light weight & shouldn’t make you overheat too bad. It’s large enough to allow for layers in the late season, making this a decently versatile vest. I did deduct a few points for security, because while the shell loops seem tight now they do seem like they’d get worn out & loose over a season or two. As far as availability goes, it doesn’t get much easier than full availability and free 2 day shipping with Prime on Amazon. 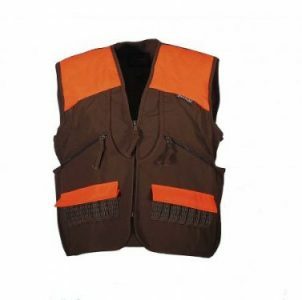 With a lower price point, we definitely consider this Switchgrass vest a pretty good value. Don’t expect to feel like you’re wearing a $200 vest, but the Gamehide Switchgrass upland hunting vest certainly gets the job done for a reasonable price. Almost more of a backpack than a vest, the Tenzing BV16 is incredibly comfortable. Notes: Tenzing definitely did their homework with this vest. I would almost consider this more of a backpack than a vest, but its great for getting your gun to your shoulder quickly. While you wouldn’t know it from looking at their pictures, there are actually 14 shell loops in the pockets. It also has a big enough pouch to carry a limit of grouse and woodcock, along with anything you might need to bring along for your bird dog. The biggest thing I noticed about this upland hunting vest is simply how comfortable it is. The design allows the straps to hug your upper body really well, and the pouches stay where they should due to the belt. It’s definitely quite a bit pricier than the Gamehide Switchgrass vest we reviewed above, but if you aren’t on a tight budget I would still consider this a great value. The sizes are quite a bit more limited than I would typically like, but it isn’t quite as big of a deal since this is more of a backpack-style hunting vest. The straps and belt are adjustable so you can still get a pretty secure fit. Like the Gamehide Switchgrass, Tenzing also offers this upland hunting vest on Amazon Prime, meaning you can get free 2 day shipping. All in all, this is a great vest even though it’s on the higher end of what we would normally consider within our budget. With the higher cost definitely comes a better fit & better value. With a high price point and a “one size fits all” approach, we’re looking elsewhere for a vest. Notes: The Badlands Upland Hunting Vest is a decent little vest, but much like the Browning Bird’n Lite it leaves us hoping for a few adjustments down the road. The first things that pop up are the price point & the lack of sizes available. It would appear as if Badlands was going for a “one size fits all” approach with this vest, but there’s no way that’s going to work for most upland hunters. That combined with the highest price point on the list at almost $200 from some retailers was all we needed to look somewhere else. The actual design of the vest isn’t too bad though. 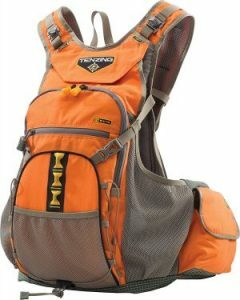 It holds all you’d need it to and more, and is even specially designed to hold water packs for you and your dog. The perforated shoulder straps are also a great idea, and adds a bit of breathability where most other vests don’t. All in all its not a bad vest, but there is definitely better value out there. If you enjoyed this post, do us a favor and give us a like up top! You’ll also definitely want to check out our recent article on our rundown of the top pairs of brush pants out there!